The world’s first supersonic short-take-off, vertical-landing aircraft just landed in the Pacific this month, launching the Marine Corps into a new era of expeditionary aviation. The F-35B, which is set to replace the AV-8B Harrier, F/A-18 Hornet, and EA-6B Prowler, is also versatile. It takes off and lands vertically like a Harrier while outclassing the Hornet in air-to-aircombat and building upon the Prowlers capabilities in electronic warfare. As the forward-deployed force-in-readiness in the Pacific theater, III MEF will be able to better support their regional partners during crisis by enabling their forces to perform a wide range of missions across multiple domains, he explained. 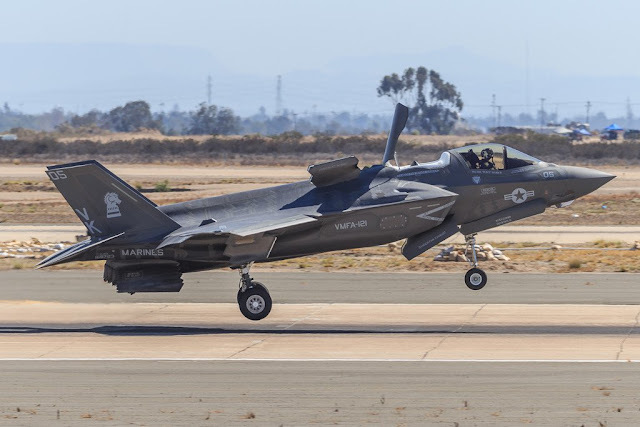 By integrating the F-35B, which can take off and land vertically from naval vessels, the Marine Corps is strengthening its partnership with the U.S. Navy, a priority of Gen. Robert B. Neller, Commandant of the Marine Corps. This multirole combat fighter is intended to bring true service interoperability by strengthening international cooperation 3rd Marine Aircraft Wing, conducts an aerial refuel while transiting the Pacific Northwest from Marine Corps Air Station Yuma, Ariz., to Joint Base Elmendorf-Richardson, Alaska … 2 of 2 and allowing for improved communication among allies. The F-35 is able to accomplish this by using a combination of stealth, electronic warfare and information sharing capabilities. With ten other allied nations slated to receive the F-35, it will be the backbone of future air operations. The first F-35A for Japan was presented Sept. 23, 2016. "The relationship between two allies in a military venue can be defined by our interoperability," said Jansen. "We have an obligation for mutual defense; that if they are in trouble we will come help them and if we're in trouble they can come help us. So we have to be able to have the same type of equipment; equipment that can talk to each other, equipment that can seamlessly operate as one unitary force. That interoperability piece is huge."